With many custom blends available to suit your baseball field’s unique needs – more variety than any competitor – Mar-Co diamond clay conditioners give you the surface you’re looking for. Whether your field is too hard, too soft, too wet, or too dry – we have a conditioner that can give you better play. Get a soft texture, very high drainage, and good water retention for any size ballpark with Mar-Co diamond clay conditioner. 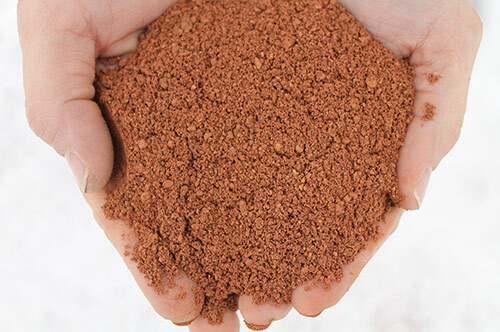 Created from baked clay that’s been crushed and screened into a uniform size range (1/8” or less), this red-orange product is designed as a conditioner for heavy clays and is most suited to improving infields with drainage issues. As a distributor of Pro’s Choice products, Mar-Co offers calcined clay with the industry’s highest absorption rates and best durability. 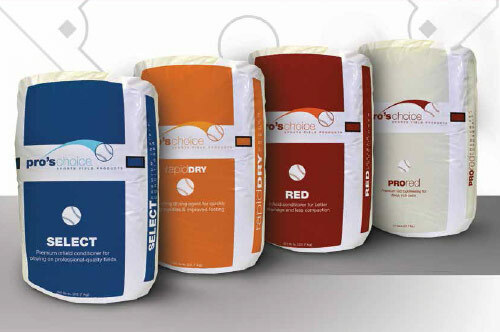 Pro’s Choice professional infield conditioners ensure minimal dust, maximum absorption, and excellent water retention. Their secret? Thermally optimized montmorillonite – a type of clay mineral – that drives out moisture and enhances porosity. Mar-Co’s free Materials Assessment Program (M.A.P.) determines the precise product, or Target Amendment, you need to add to your existing field mix to achieve the surface you want and need. It takes just a few simple steps. "Maintenance of the fields is so much easier and faster then it ever was before we installed the MarCo Clay. If time, looks, and play are important to you then I would recommend installing the MarCo Clay mix on your field." "The MarCo Clay has increased the playability of our fields from the stand point that we can get fields ready for play sooner after a rain storm. We have been asked to host the Williamsport Little League District tournaments in our area. We have had positive feed back from many of the teams that have played on our new MarCo Clay fields. Maintenance of the fields is so much easier and faster then it ever was before we installed the MarCo Clay. If time, looks, and play are important to you then I would recommend installing the MarCo Clay mix on your field."